Diomedes and Polyxena, from the Etruscan amphora of the Pontic group, ca. 540–530 BC. In art history, ceramics and ceramic art mean art objects such as figures, tiles, and tableware made from clay and other raw materials by the process of pottery. Some ceramic products are regarded as fine art, while others are regarded as decorative, industrial or applied art objects, or as artifacts in archaeology. They may be made by one individual or in a factory where a group of people design, make and decorate the ware. Decorative ceramics are sometimes called “art pottery”. 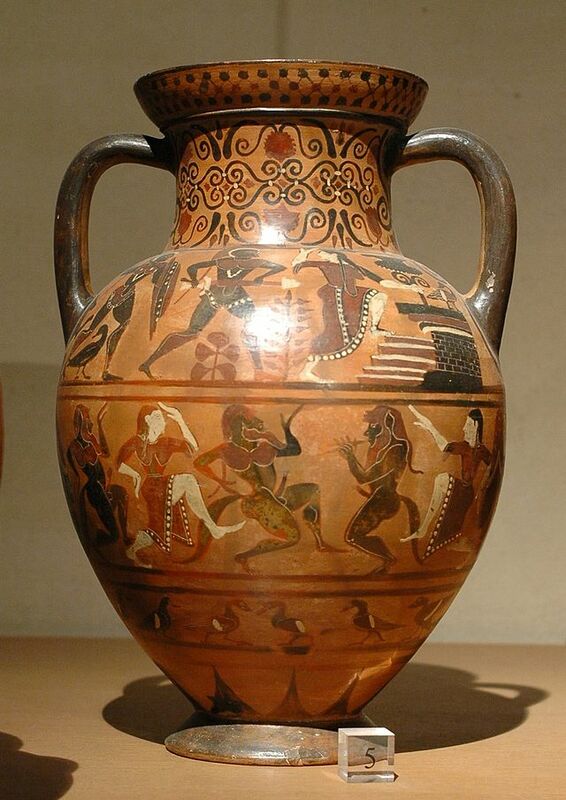 The word “ceramics” comes from the Greek keramikos, meaning “pottery”, which in turn comes from keramos, meaning “potter’s clay.” Most traditional ceramic products were made from clay (or clay mixed with other materials), shaped and subjected to heat, and tableware and decorative ceramics are generally still made this way. In modern ceramic engineering usage, ceramics is the art and science of making objects from inorganic, non-metallic materials by the action of heat. It excludes glass and mosaic made from glass tesserae. The earliest evidence of glazed brick is the discovery of glazed bricks in the Elamite Temple at Chogha Zanbil, dated to the 13th century BCE. Glazed and coloured bricks were used to make low reliefs in Ancient Mesopotamia, most famously the Ishtar Gate of Babylon (ca. 575 BCE), now partly reconstructed in Berlin, with sections elsewhere. Mesopotamian craftsmen were imported for the palaces of the Persian Empire such as Persepolis. The tradition continued, and after the Islamic conquest of Persia coloured and often painted glazed bricks or tiles became an important element in Persian architecture, and from there spread to much of the Islamic world, notably the İznik pottery of Turkey under the Ottoman Empire in the 16th and 17th centuries. Transmitted via Islamic Spain, a new tradition of Azulejos developed in Spain and especially Portugal, which by the Baroque period produced extremely large painted scenes on tiles, usually in blue and white. Delftware tiles, typically with a painted design covering only one (rather small) tile, were ubiquitous in the Netherlands and widely exported over Northern Europe from the 16th century on. Several 18th century royal palaces had porcelain rooms with the walls entirely covered in porcelain. Surviving examples include ones at Capodimonte, Naples, the Royal Palace of Madrid and the nearby Royal Palace of Aranjuez. Elaborate tiled stoves were a feature of rooms of the middle and upper-classes in Northern Europe from the 17th to 19th centuries. This entry was posted on August 2, 2014 at 6:53 pm	and is filed under Uncategorized. You can follow any responses to this entry through the RSS 2.0 feed. You can leave a response, or trackback from your own site.